Today I asked my officemate “How do you spell center?” By which I meant “How do YOU spell center?” I asked because I was finding it strange that my Australian copy of Word was red underlining my spelling of “center” and insisting on “centre” instead. In the U.S., at least, both spellings are common and accepted. I was surprised Word was marking “center” flat-out wrong. Not knowing the Australian viewpoint on the matter, I asked the nearest Aussie, my officemate. Her response was that I should Google it. This also struck me as odd. I tried to explain that “er” versus “re” was the question I was after. Still, she insisted that Google would provide the answer. Slowly I came to realize that her take of the situation was that I truly did not know how to spell the word “center” and was asking her for help. I had failed to communicate that I was curious about local spelling conventions. Instead I had somehow given the impression I was an utter, drooling moron. There I was, making notes on an experiment, calculating frame rates in my head so I could program a Matlab routine to display stimuli for the right number of milliseconds, and the person sitting next to me blithely assumed I was a subliterate bogan. People miscommunicate all the time. I miscommunicate all the time. But I don’t know if it pains other people as much as it does me. Even when the miscommunication does not (as it did today) involve the other party assigning me a single-digit IQ, even when the miscommunication is simple and slight, I feel it as a loss, as a deep pain. How can words fail me so often? Why do I find it so hard to connect with people? This entry was posted in Uncategorized and tagged australia on July 22, 2009 by shotgunapproach. When in Crazytown, eat what the Crazytonians eat. Aussies are a creative bunch. Especially when it comes to food. Curry on pizza. Kangaroo steak with pumpkin. I hadn’t seen anything until I visited the Queen Street Mall, however. Waiting there was a culinary offer I could not refuse. It was the Hot Dog Crepe that initially caught my eye. But it was the Beef Stroganoff crepe that sealed my fate. If I knew nothing else, I knew I would be eating lunch at the Crepe Cafe. Now, I love crepes. And I love beef stroganoff. Together, though? I wasn’t sure. So how was it? 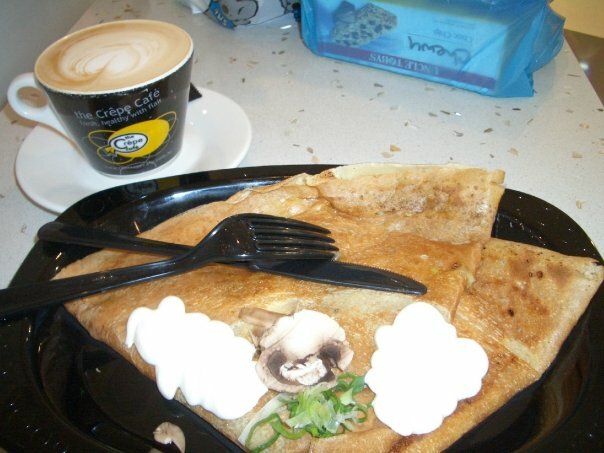 Well, biting into a crepe and finding the taste of beef stroganoff is like kissing an angel that just ate some chocolate chip cookies. Which is to say, IT WAS AWESOME. If my heart could take it, I would eat this every day. This entry was posted in Uncategorized and tagged australia on July 8, 2009 by shotgunapproach. In Demolition Man, police officer John Spartan is cryogenically frozen and revived in San Angeles, a utopian/dystopian repressed future Southern California. After using the facilities, Spartan searches for toilet paper and finds instead only an enigmatic set of three seashells. The movie (wisely) never explains how these are to be used, leaving the audience just as puzzled as the protagonist. In Australia, I’ve encountered my own version of the Three Seashells. Every toilet down under has two buttons. In the example pictured there is a smaller button and a larger button. On others one button is labeled with a filled semi-circle and the other a filled circle. One might guess at the proper use of the two buttons, and one might be right. I’m still not sure. As one hypothesis, I thought one button might produce a bidet action. Upon testing (standing well back to be safe), I determined this was not the case. 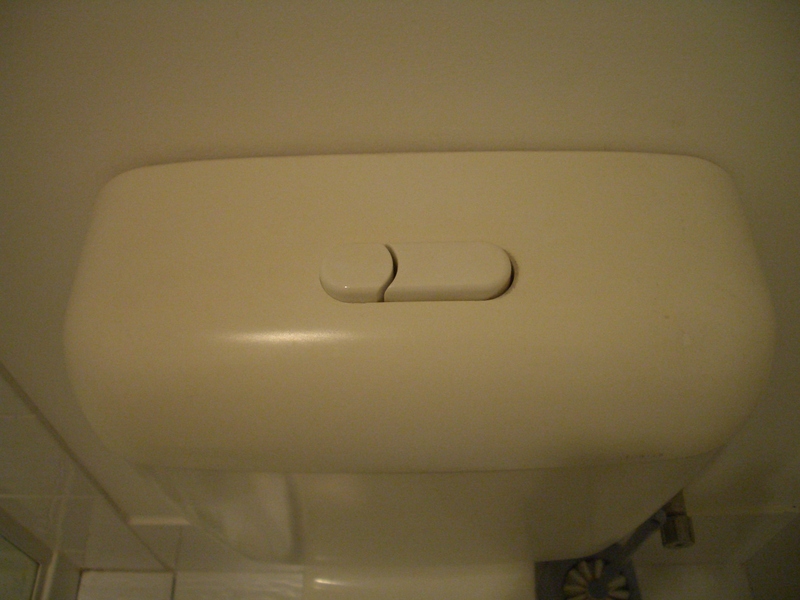 Failing some special function, it seems implied that one button should produce a stronger or longer flush than the other, but on casual inspection I would say if this is the difference, it is a subtle one. So, the purpose of two different buttons remains a mystery to me. It may be better that way, as you really do not want to know how the three seashells are supposed to work. Really, I’m warning you not to click on that link. It will take you to a blog called the Poop Report. Consider yourself forewarned. This entry was posted in Uncategorized and tagged australia on July 7, 2009 by shotgunapproach. 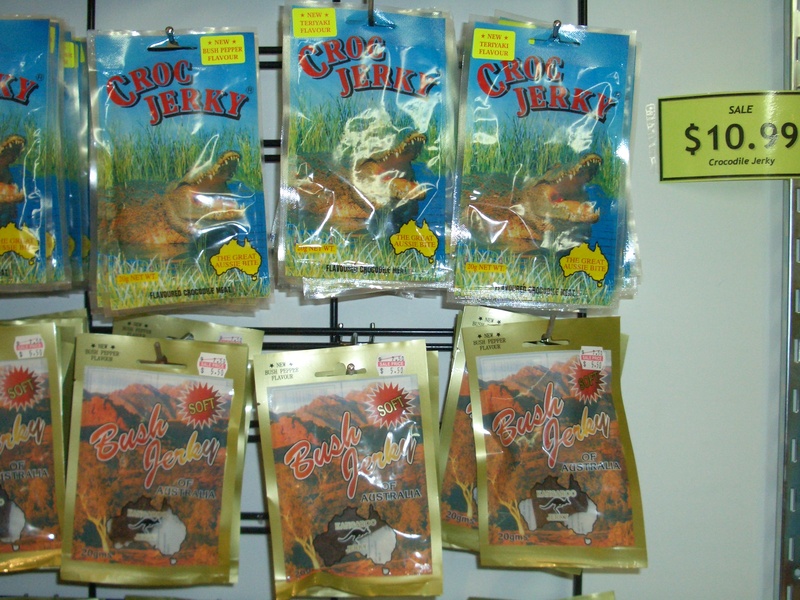 …you can choose between crocodile and kangaroo jerky in the airport gift shop. …you can ogle Bronzed Aussie Girls from the future! Imagine the bronzing technologies 2010 will bring. This entry was posted in Uncategorized and tagged australia on July 6, 2009 by shotgunapproach. 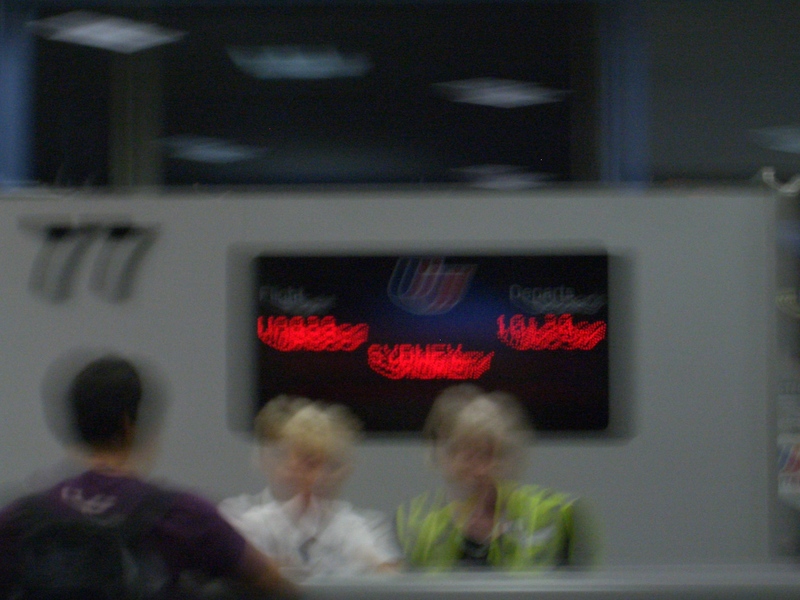 Low light is like LSD for my camera, but I assure you the sign reads “Sydney.” Taken at the gate at LAX just before boarding the 14-hour flight to the downunderverse.